The Message Board (Note Board prior to Game & Watch Gallery 4) is a location in the Game & Watch Gallery series that commonly stores messages about the game itself and tips & attacks about their respective minigames. As in Game & Watch Gallery, the Gallery Corner itself does not appear, but tips & attacks (they appear after losing any match (any game/version) with less than 100 points) and notes (they appear before entering the Game Select screen) are included separately. In Game & Watch Gallery 2, the Note Board stores unsorted messages. It seems to be located in the sky (with a castle as a background), with Toad (who hosts the Note Board) and Mario (who appears playing Game Boy Color). In the messages, Toad appears to be sitting (with a grassy plain as a background). The Note Board in this game now sorts the messages and tips/attacks separately. It seems to be located in a grassy plain (with hills as a background), with Toad (who hosts the messages) and Yoshi (who hosts the Tips & Attacks). In the messages, a Shy Guy and a faced flower appear (with a grassy plain, a lake, a forest and pyramids as a background). Yoshi introduces the Gallery Corner. In this game, the Note Board is now called Message Board. 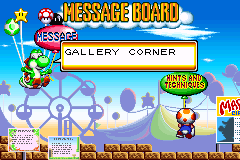 It seems to be located in an amusement park (as a background), with Yoshi (now hosting the note messages) and Toad (now hosting the Hints & Techniques messages). 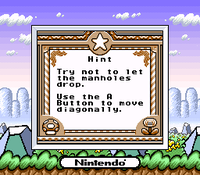 In the Note Messages, Yoshi appears to be eating mushrooms (with some trees as a border), and in the Hints & Techniques messages, some Toads appear to be carrying some items and coming from a Warp Pipe. This page was last edited on March 23, 2019, at 09:05.